It's probably not entirely accurate to say I'm neutral about domesticated cats. Put it on a scale of 1-to-10, and I'd give them a 6 or so. Cats, after all, are useful. Let a cat live in the house, and you're likely never to have a rat or mouse problem. They're also interesting to watch. And so I've never been a cat-hater, just a little above neutral instead, I think. That was before. This is now. My wife wanted a Siamese kitten for the kid that lives here because the kid who lives here has turned three, and my wife was given a Siamese kitten when she was three. My wife seems intent on replicating her childhood by cloning it onto the kid who lives here. Me? I'd like to go back to France. Or maybe Fort Bliss. Both were stopovers in my childhood worth replication. My brother and father had a cat way-back-when, a male that no one ever fixed mainly because Tom spent his days at the barn do the good work of cats -- keeping vermin out of the barn. Tom would arrive early in the morning, though, get a little treat and sleep on my brother's bed until someone found him and put him outside again. Tom lived with us during four different moves. Even my father liked him, even though my father was a dog-person like me. The point to this rambling is that my brother and father always thought it great fun to hand me Tom the cat. So, what's the big deal, you ask? I don't like cat claws, and because of the paralysis, my legs are sensitive. That's not to say that Tom was a scratcher and bitter. He wasn't, but at some point during the Here you hold Tom while I session I'd get a claw or two puncturing something. My wife and I have had cats. 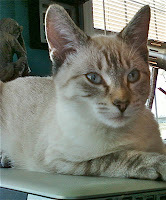 Silky the Siamese. Zipper, the Manx-Siamese cross. Boo, the terribly introverted Persian. Dicky, the male Siamese who grew up not to like dogs. Ripley, the Manx who believed I was an alien and was prone to hiss and threaten to attack if I glanced at her. And now Shorts, the cat-of-no-particular breed with two white rear legs who reminds me of someone vacationing in Florida in a pair of Bermuda shorts. As you might guess by the odd assortment of names, I didn't get to name Tammy. That name came from my wife, who had so named her cat those many years ago. Actually, to meet full disclosure requirements, the cat's name is Tammy Aurora since the kid who lives here is going through a Disney stage which is far better, you know, than a Justin Bieber stage. Here's the wrinkle. Tammy the cat has adopted me. She comes like a dog if I call her. She's cat-on-the-spot when I open the refrigerator. Her modus operandi is to sit on the bottom shelf and watch to make certain I won't take something cat-edible with giving her a proper share. She sleeps at the head of my bed. She likes buffalo jerky. And turkey jerky, for that matter. She enjoys sitting on my laptop when it has been folded up into the sleep mode. The cat likes me, in spite of the widely circulated knowledge in the realm of feline that I am only a 6 on the 10 point cat empathy scale. Did I mention that Tammy also drinks from the toilet bowl? She actually prefers to drink from a running stream of water at the kitchen sink, but she's willing to dip into the great porcelain goblet if it is handy. I think I like Tammy, and if the truth be told about that mere 6 on the cat scale, I think that like'yness comes because this is the first cat I've ever been around that isn't an egomaniacal sociopath.